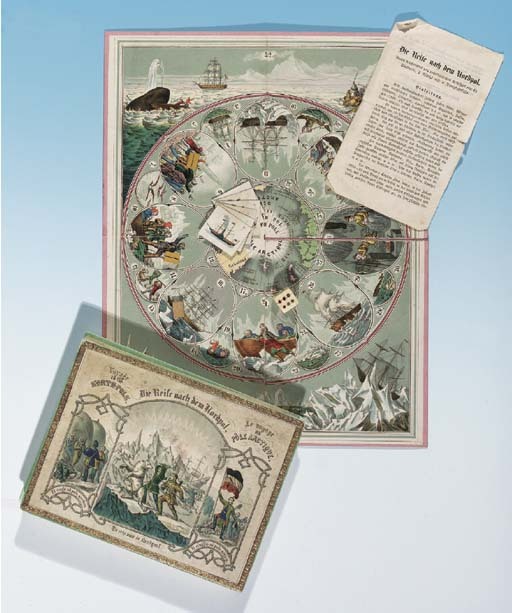 A children's board-game, titled Die Reise nach dem Nordpol Voyage to the North Pole Le Voyage au Pôle Arctique... [Germany: no date but circa 1869]. consisting of a folding hand-coloured lithographic board (422 x 334mm.) (neat repair to one fold), one inlaid bone die (slightly damaged and cracked), 6 hand-coloured lithographic 'steamship' counters (35 x 42mm) with 3 wooden holders and 4pp. of explanatory text (200 x 115mm.) in German (creased and slightly browned). All within original card box with lift-off lid (185 x 240 x 27mm) with hand-coloured lithographic title pasted to lid (lightly soiled, extremities scuffed). A rare survival. Despite the title being in English, French, Spanish, Dutch and Italian as well as German, the tone is set by one of the vignette illustrations shown on the lid: a German Naval officer plants the German flag on a cairn, cheered on by his men. This nationalistic element is carried through to the counters and also the explanatory text.